Here’s another fine example of the vintage design trend I wrote about more than a year ago. Simple, flat graphics that are hauling truckloads of charm and making it look easy. By contrast, this has all the genuine and wholesome charm of a creep in a van parked near a playground at dusk. Do I need to point out that he’s... ahem... saluting? Another huge thank you to P*S* Reader and iPhone user Brent Morris for the submissions. Wow. I love the new box! 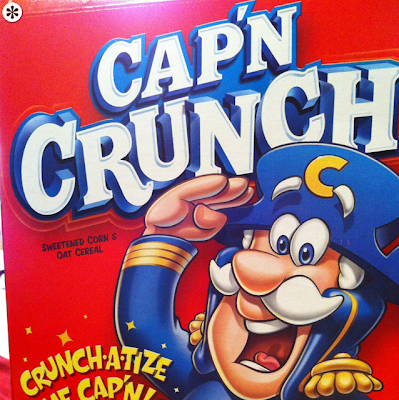 Why are there no female cereal box mascots? it was Ensign Wesley Crusher, not Enson. I knew I should have double checked the spelling of ensign before posting that to Facebook. That's not embarrassing at all. And I wasn't actually going for a Wesley Crusher reference, ya big nerd. What is killing me on the new design is the eyes that have no relation to the face and then I was trying to figure out the apostrophes under the C on the hat when I realized it is supposed to be eyebrows. Perhaps I can get a job at General Mills if I just show off my grade school drawings and pass it off as educated design. This website breeds the most immature hate I've ever seen, and I'm embarrassed for everyone involved. Really, claiming your grade school drawings better? Would you say that to the illustrators face? Wait. The person questioning whether any of us would say that to the illustrator's face leaves a nasty comment anonymously? Remarkable. As for "everyone involved"... it's just me (unless you're implying commenters are "involved"). And yes, I would gladly say any of this to any designer's face. The point is not to breed immature hate. The point is to breed better thinking and better design. 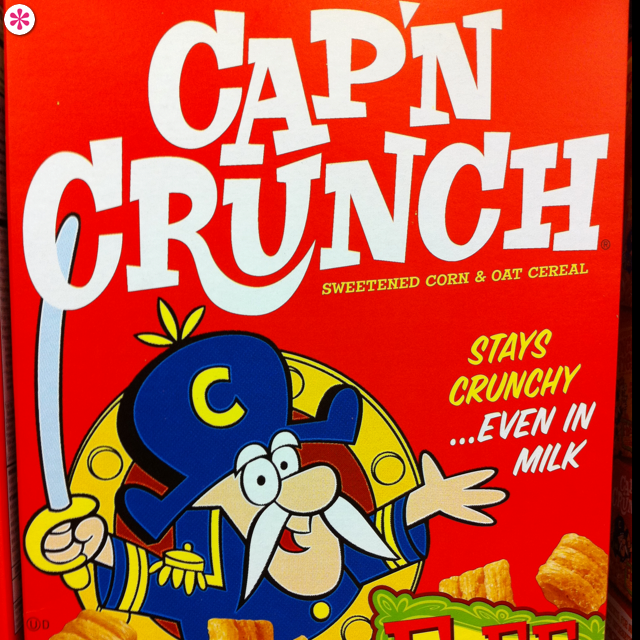 I encourage differing opinions and dialogue, so go ahead and tell us how the non-vintage Cap'n succeeds in your view. I'm sorry, the whole "immature hate" comment was a bit over the top, I apologize. I did come off as an nasty in my comment after re-reading it, I'm truly sorry about that. I've had people give me harsh critique before and it never makes me feel too great. I guess I just wanted to give some defense for the sh*tty guys. I feel silly now. I think the Cap'n comes off as a little creppy because the box still has that 90's X-TREME look to it, but I think that the box speaks to modern kids better than the vintage one. As charming as the "will stay crunchy...even in milk" line is, kids are not going to respond to that. I agree the vintage box looks friendlier, but I think the modern box is going for a look that hyper-active kids will be drawn to. No worries Mike. You're entitled to your opinion. I would counter your argument with this: kids don't actually buy cereal. Moms do, for the most part. As a lifelong cereal consumer, I know a few things: A cool box got me to beg my parents for cereal a few times (remember the Ghostbusters packaging with holograms?). But delicious cereal gets me to buy it over and over. At this point (I'm 30 with one child), the look of the box is not nearly as important as staying true to the recipe. (But you're right, the new design is poor). Yes, I would say that to the designers face. I would want them to point out each element of the design and defend it. It is what I do for my clients.